John Wells’s phonetic blog: A Korean IPA? I don't see this catching on. Hangul is very easy to learn, but it takes quite some time to begin reading it with any speed. It's a bit like proposals to replace the five-line notation of music with something else – it ain't gonna happen. A bit appalled... A large literate part of the world uses some sort of an alphabetic system. It's reasonable for the majority of us to use similar characters as alphabets even in describing the sounds. Otherwise, I personally prefer to use a more politically neutral (?) Bell's Visible Speech. What's wrong with some Korean poeple with such an extreme nationalism? He sounds like follwing the footsteps of Sun Myung Moon of the Unification Church and Daisaku Ikeda of the Soka Gakkai International. Actually, the putative web page is there, but neither requires nor permits the usual "www." prefix. Thus the actual address of the page is http://ikpa.snu.ac.kr/ (typed from memory, because for no obvious reason I cannot paste into this text box using SeaMonkey 2.0). Thanks to John Wells for posting IKPA(or Korean IPA/Lee's IPA). A revised version of IKPA transcription of world languages with due corrections will be mailed to you. Further information on IKPA: Type HB Lee IKPA in the internet window. IKPA has nothing whatsoever to do with nationalism or politics. It is science, phonetics,linguistics and speech pathology, etc. No one would say that Bell proposed Visible speech with British nationalism in mind. 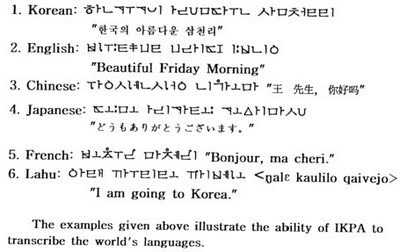 IKPA is just as neutral and scientific as Bell's or Sweet's Visible speech except that IKPA is based on the Korean Alphabet that was invented by King Sejong in the 15th entury for the common people who couldn't afford to struggle with the difficult Chinese characters.